First Solar: Number 1 in Sales – but can it stay there? First Solar was the largest manufacturer of solar panels in the world for the past 6 quarters (with 8.4% of all solar panels produced in the first quarter of 2010). First Solar's panels are made using Cadmium Telluride (CdTe) Technology. It took them 25 years to reach this point and the company has seen a major run up in its stock price since the Company's IPO in 2006 from €20 to $200/share, although it has fallen since that high (currently around $147 / share at the time this article is written). The predecessor company, Glasstech Solar, was founded in 1984 by inventor/entrepreneur Harold McMaster – who had made a fortune as the developer of Permaglass and was a recognized genius in working with glass. In the 80s, McMaster got interested in solar technology and experimented with different ways to put photovoltaic materials on glass. He worked first with silicon and then cadmium-telluride with a company called Solar Cells. In February 1999, McMaster sold the company to True North Partners, an investment arm of the Walton family, owners of Wal-Mart. A new company was founded in 1999 – and given the name, First Solar. John Walton, Walmart Founder invested $250 into the new company. In its early years the Company suffered setbacks, and initial module efficiencies were modest, only about 7%. Commercial products became available in 2002. But production did not reach 25 megawatts until 2005. The company built an additional line in Perrysburg, Ohio, then four lines in Germany, supported by the then substantial German production incentives (about 50% of capital costs). 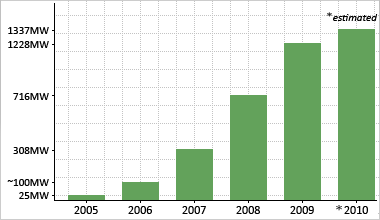 In 2006 First Solar reached 75 MW of annual production and announced a further 16 lines in Malaysia. The Company kept on tweaking its manufacturing process. But company documents say that it progressively ratcheted up production at its first plant in Perrysburg, OH, from a few hundred kilowatts of modules per year in the early years to 75 megawatts last year. The Company now produces more than 100 megawatts' worth of panels per year, thanks to a new plant in Germany. Why Are They #1 in Solar PV Production? 1. Experience: McMaster was one of the world's experts on tempered glass, this experience coupled with their pioneering work in the 1980's and 1990's gave them a lot of valuable technical knowledge and manufacturing experience. 2. Patient Investors: John Walton, of the Walton family fortune, was an early investor and stuck by the company through the very difficult early years. Interestingly, none of the big solar success stories have been emerged from the usual path of being fostered along and funded by VCs, which usually want a return after five years or so. Instead, these companies have taken years to incubate. In this case, patience really was a virtue. 3. Their Own Machines. First Solar developed proprietary machinery that can churn out high volumes of cells. What's more, the company can replicate those factories to rapidly expand capacity. In a sense, the entire thin film solar industry is a competition around who can build the best machines. The company doesn't let you see those fancy machines either, says Myers. He visited the company and was barred, like other visitors, was prevented from getting an up close look at the production line. 5. Low Price Per Watt. In the fourth quarter of 2009, the Company crossed the coveted $1.00 / watt barrier with its proprietary "thin film" panel. It cost just 98 cents a watt to manufacture a module back then. And costs have been dropping ever since. In 2012, solar panel production costs are expected to plummet to around $0.65 to $0.70 per watt of peak power provided, the company has said. 6. End of Life Program. Cadmium can be toxic, which scares some people away. To counteract this fear – and to provide valuable materials it can re-use, First Solar established the industry's first comprehensive, prefunded module collection and recycling program. The program is designed to maximize the recovery of valuable materials for use in new modules or other new products and minimize the environmental impacts associated with PV system production. Approximately 90% of each collected First Solar PV Module is recycled into new products, including new modules. By deploying clean and sustainable sources of energy, the Company is creating energy solutions today without creating waste management challenges for future generations. 7. Strategic Relationships. First Solar and Ordos (Inner Mongolia China) have agreed to jointly develop a 2 gigawatt (GW) solar power plant. Phase 1 was expected to start construction in June 2010 for 30 megawatt (MW). They have also agreed to establish two committees to ensure the successful execution of the project and to develop a new energy industry in Ordos. 8. Utility Systems Business Group. In July 2010 the Company announced the formation of a new group to focus on large scale utility projects and shortly later announced it's intentions to acquire Next Light – which will give it access to 2.2 GW of Utility Projects in the USA. For full details click here. Given their success, how come they don't have any major competitors making cadmium-telluride solar cells? The answer is that they do, but it takes a while for these competitors to develop their own machines and manufacturing expertise, and to get their products to the market. There are a number of other start-ups in CdTe today: Q-Cells' Calyxo (Germany), GE’s PrimeStar Solar (Arvada, Colorado), Arendi (Italy), and Abound Solar (Fort Collins, Colorado). Including Antec, their total production represents less than 70 megawatts per year. Germany's Q-Cells is building production of a line of cadmium-telluride cells through its Calyxo subsidiary, but it won't go online until 2011. The first plant Calyxo plant will only have a 25 megawatt capacity. Technology giant General Electric will focus its research and development efforts on thin-film photovoltaic technology in collaboration with start-up company PrimeStar Solar Inc., in which G.E. holds a majority stake. G.E. plans to exploit the great potential of PrimeStar’s cadmium telluride technology in developing a breakthrough thin-film photovoltaic solar module at PrimeStar’s head office in Arvada, Colorado. Additionally, VCs have poured over $2.3 billion into 35 start-ups that hope to make copper-indium-gallium-selenide (CIGS) solar cells in the last few years which should compete with First Solar for market share. 1. Lower PolySilicon Prices / Price Competition from China According to some experts, the prices for polysilicon have fallen between 50% and 60% in the past 18 months. Although Cadmium Telluride is traditionally the least expensive solar technology, Trina Solar, and other Chinese polysilicon solar manufacturing are also narrowing the pricing gap with First Solar, most notably Suntech Power and Yingli Green Energy. Germany, the company's largest market, is expected to suffer the most from this pricing war. UBS analysts have estimated that the solar panels being sold by Asian firms often have price tags that are two-thirds that of those created by German companies, knocking some out of business. To defend its "core market" from Chinese silicon competitors, the Company announced plans to hand out rebates to customers who do business in Germany. The customers will receive the rebates when their installations are complete. Though the company's profits remain solid, and its U.S. business continues to surge on the back of stronger government incentives, investors and analysts saw the rebates as a troubling sign for the company's future. First Solar's stock price tumbled 10 percent on the news. Note: Recently the Chinese government provided $17 Billion in loan guarantees to Trina Solar, Yingli Green Energy and Suntech Power (click here to read the article). So it's very likely we'll see a lot more competition from the Chinese in terms of lower cost panels in the near future. The EU’s decision on whether to exempt solar makers from regulations on hazardous chemicals, such as cadmium and lead is expected in the fall of 2010. Its repercussions could be profound, particularly on First Solar, which makes a cadmium-telluride thin-film cell. But the Company is not alone in feeling the pain. General Electric and its partner PrimeStar Solar also work with cadmium, as does Abound Solar. Currently, Cadmium is not regulated in the USA … where the Company is planning to build 2 GW of large utility sized projects. 3. Tellurium Supply: Tellurium is a very rare mineral and production levels are not showing any great increase. While working on this article I found articles in mining magazines that were of the opinion that the capacity for manufacturing thin-film photovoltaic solar cells from cadmium telluride already exceeds the maximum supply of tellurium available, or that may become available. 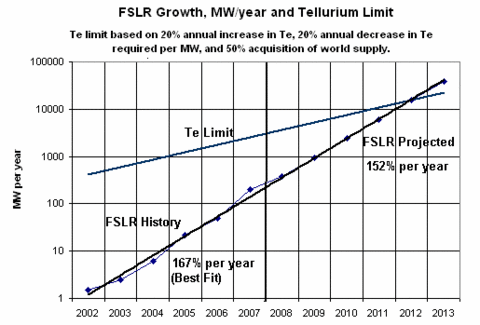 In other words – the amount of tellurium may be a limiting factor to the growth of First Solar. The following are a list of articles about First Solar that were posted on our sister blog, Solar News and Views Blog. Interview with President, Bruce Sohn, regarding the company's mission to reduce module costs to less than $0.70 per watt peak of power in the next 4 to 5 years click here to read the article and see the interview. FS doubles German PV Manufacturing Capability click here to read the article. FS acquires next light to expand penetration of large utility sized projects in the USA click here to read the article. FS has record results in the 1st Quarter of 2010 click here to read the article. FS was the top PV Manufacturer in 2009 click here to read the article. October, 2010: The World's biggest solar project powers up in Ontario, Canada. FS provided the ssolar panels. click here to read the article. October, 2010 First Solar announces plans to build w new plants (USA & Vietnam). The new plants will add 500 MW capacity of high performance modules. click here to read the article. November, 2010 First Solar falters and drops to number 3 behind Chinese cyrstalline silicon manufacturers Suntech and JA Solar. Click here to read the article. Click on the appropriate link to return to the top of this page about First Solar or to learn more about solar panels in general made using Cadmium Telluride technology.